Description This set was never issued by Micromodels. Preparation was announced in the 1949 catalogue (with the above full title). It was still catalogued as in preparation as late as 1956, whilst the Drummond of this set had already been issued in PG VIII in 1953. 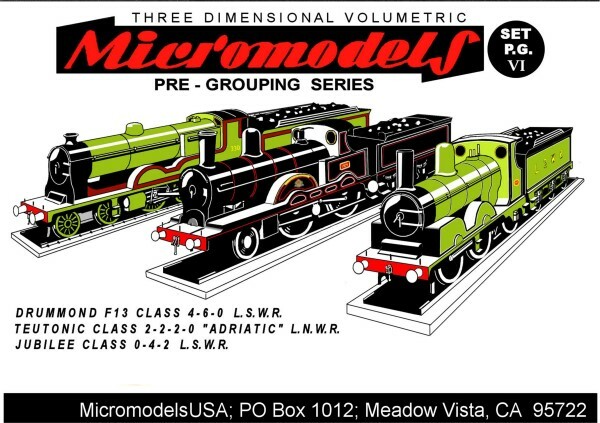 The Micromodel archive does not even contain a wrapper or a sketch of the other two locos. One can speculate that PG VI was probably abandoned because Heighway realized that the projected model of the LNWR “Adriatic”, which was a 2-2-2-0 Webb Compound (not a 2-2-2), looked too much like the LNWR 2-4-0 “Hardwicke” of PG V. Heighway then substituted a larger type of compound, the 4-2-4 “Greater Britain”. This one appeared in PG VIII (issued chronologically as the next set after PG V). MicromodelsUSA has published set PG VI in 2014. It was designed by Pete Watson.